On our third trip to Boracay, no plans were made except to just bum around. No adventurous activities. Just lie down on the beach, read a book, swim in the sea or pool, or just return to our room have a siesta or watch TV. The trip to Boracay all started when I booked a flight from Kalibo going to Manila on the morning of 13 February 2012 with a 15 kilo baggage allowance for P1,500 for the three of us (P500 each). 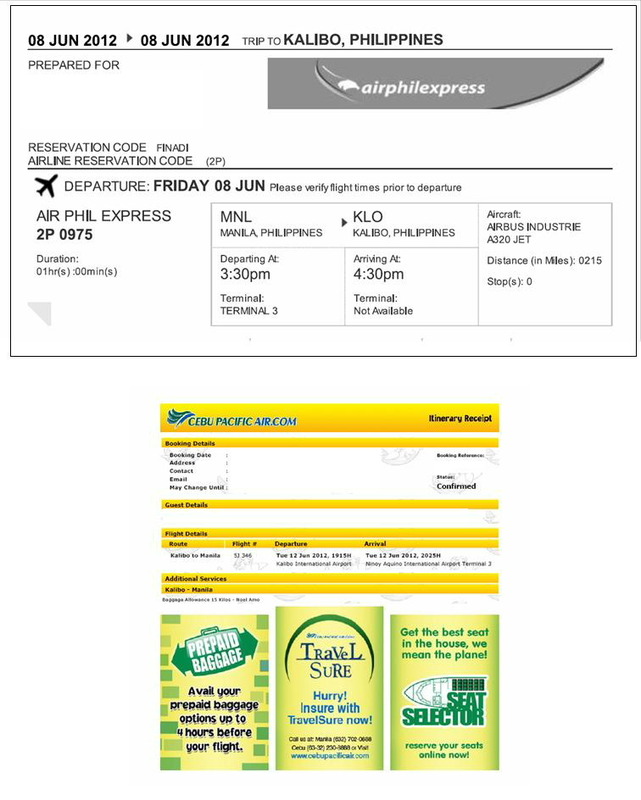 I told myself that I will have to wait for another promo fare going to Kalibo since the trip is still on June 2012. That same night, I found an Airphil flight bound for Kalibo which costs us P770 each or a total of P2,310 for the three of us with a total baggage allowance of 30 kilos. The total round trip fare for the three of us then was P3,810 (or P1,270 each). We will be staying Boracay for 5 days and 4 nights. Considering that it's a long weekend (Tuesday, June 12 is our last day), we only have to take 2 day leave from work, while our daughter will be going to school the following day after we returned. Then about a week after, we went to the travel expo at the SMX Convention Center. We were able to book a room at La Carmela de Boracay for P3,600 good for 3 nights with the 2 mornings entitling us to complimentary set breakfast. All we need now is accommodation for the last night, which we said we will just look for one when we get there. With our expenses for plane fare and 3 of the 4 nights accommodation already paid for, all we need to do is save for our pocket money. We had 4 months to save. A few weeks before our flight, we were informed by Airphils that our flight to Kalibo had been moved from 3:30 PM to 6:30 PM. I emailed back asking them for an earlier flight as we will risk going to Boracay at night. Fortunately, we were accommodated in an earlier flight, 1:10 PM, meaning we get to watch the sunset on our first day in Boracay. We left home more than 2 hours before our actual flight. Checking in was a breeze as there were only a few people on queue. As it was still early, we decided to buy some drinks on the 3rd level where various food establishments are located, including a convenience store. Paying for our terminal fee (P200 each), we passed through the x-ray machine and wen to our assigned departure area where we waited to board. There is free wifi so we didn't mind the wait of about an hour. Amazingly, the plane left on time. About an hour later, we landed in Kalibo. While waiting for our baggage, I noticed counters selling tickets for the van/boat at P200 each. After getting our things, we proceeded out where vans are waiting for passengers bound for Caticlan port. When we arrived at the Caticlan port, we paid for our terminal fee (P100 each for visitors older than 5 years old) and environmental fee (P75 each for those older than 12 years old) and proceeded to the terminal where our baggages were x-rayed and we were subjected to body search. We then went to the pre-departure area. There are two ferries going to Boracay, one are bancas with capacities between 25 to 30. They leave as soon as it is full. The other one, which we took, is the Oyster Ferry. It is airconditioned and can accommodate about 180 passengers. It takes a while before it leaves but is more comfortable and seems to be newly refurbished. The trip takes about 5 to 10 minutes. Upon arriving Cagban jetty port in Boracay, a line of tricycles wait to take passengers to their accommodations. Each passenger is charged P20. However, we decided to take one for ourselves and was charged P100. We asked the driver to take us to La Carmela de Boracay in Station 2 and were dropped at the side of hotel, where the front desk is located. We were assigned to Room 328 of the old wing and given our breakfast stubs for the next two days. We were told that we can upgrade to their buffet breakfast for another P100 each. It has a veranda but all you can see are roofs. The room really needs to be refurbished. I guess you get what you pay for: P1200/night for a "beach-front" property". Right after we settled in, we immediately went out to see the White Beach. We walked along the beach in the direction of the D' Mall which is to the left of our hotel. Along the way, we found two places where we saw water being spewed directly to the sea. Going near the place, we noticed what smelled like sewage. We walked further till we reached the D' Mall and had dinner there. A lot of people were queuing to order their dinner at Andok's. We fell in line and ordered our favorite lechon liempo and tried out their bicol express and downed them with a 1.5 liter soda. After a quick stroll at the D' Mall, we decided to call it a day. The walk to our hotel took us about 10 minutes. After waking up on our second day, we went down to have our breakfast by the pool with a view of the beach. We had the option to have tocino or corned beef with rice and egg. My wife had the corned beef and Angel and I had the tocino (cured meat). After breakfast, we decided to have a quick dip in the sea. The water was warm and so was the weather. After spending some time on the beach, we had our lunch at Deco's Batchoy. We had silogs and an order of batchoy with all you can have of batchoy broth, he he he. After our meal, we went back to the hotel to take a dip in their pool then have a siesta in our room. Before sunset, we went to Station 1 to use our P1000 voucher at Guilly's Restobar which we had earlier purchased for P500 at group buying site. The tricycle fare costs P10 each. The restobar is just across the Cocomangas and church. From where we got off, we had to pass through Guilly's to get to the beach of Station 1. We opted not to have dinner first as it was still early. We strolled along the beach to watch the sunset and have some photos taken. We were getting hungry and since the sun had already set, we went to Guilly's to have our dinner. We were the first clients of the day since the crowd only starts going there after 9 AM according to the waitress. We used the voucher and ordered some food and drinks for us. Later on, about two more bigger groups came in bringing their own vouchers to have dinner too. After dinner, we took a cab to the D' Mall where we bought some chips and drinks to eat in our room later on. The Budget Mart is at the back of the mall and the price are relatively cheaper than what you buy near the beach. Tired from the whole day activities, we immediately dozed off not being able to consume the grocery items we bought. Sarap 5d4n! Great bonding before the schooling. And got a lucky promo there! Enjoy! @tin, well sometimes you have to learn the hard way. the only consolation we've got is it was relatively inexpensive, near the beach and had a pool.